In Jakarta, Indonesia, a movement led by women is fighting against the privatization of water to ensure that affordable access to water remains a right and doesn’t become the privilege a few. The privatization the water system began in the 1990s under the authoritarian regime of Suharto, after World Bank suggested it as ‘the solution’ to the country’s drinking water crisis. 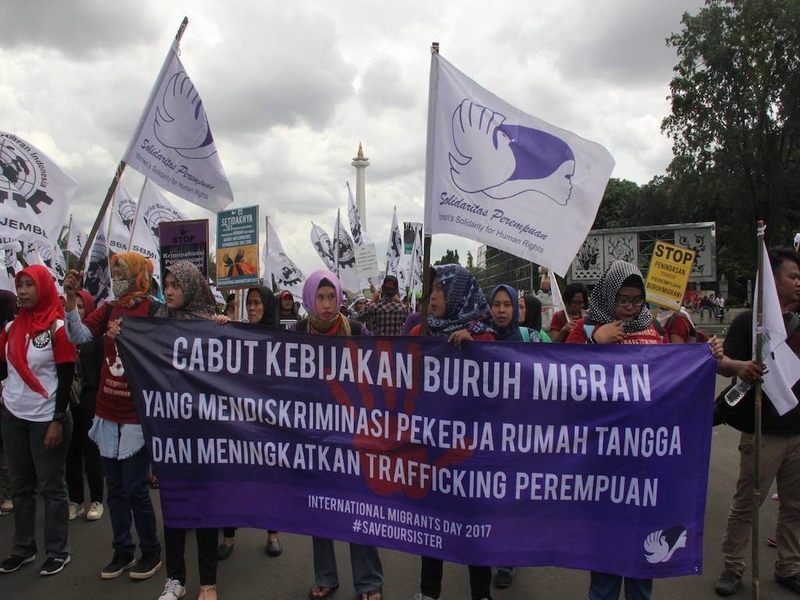 As Indonesia prepares to host the International Monetary Fund (IMF) and World Bank (WB) annual meetings this year, Peoples Dispatch spoke to Dinda Nuur Anisaa Yura from Solidaritas Perempuan (Women’s Solidarity for Human Rights) about the movement against water privatization. Peoples Dispatch: Can you tell about your organization and its work? Dinda Nuur Anisaa Yura: Solidaritas Perempuan is a feminist organization which works with more than 5,700 women in the grassroots. Our members include women peasants, fishers, and also women who are migrant workers, those in the poor urban areas and women in the forest. PD: Can you throw some light on the privatization of water services in Indonesia and the movement built against it? Before 1997, the water resources were managed by our government, but in 1997, they were given to two multinational corporations called Palyja [a French water company Suez-backed PT PAM Lyonnaise Jaya] and Aetra [backed by British water company Thames Water]. Since then, the citizens, especially the poor, have continuously experienced water-related crises. The access to water is not available to all as people have to pay very high rates for the resource. Sometimes, people have to wait until midnight for water and usually, women take up this responsibility because they believe men have to go to work the next morning and the children have to go to the schools. In addition, the quality of water supplied is not good and it affects the reproductive health of women. These problems were going on for a long period of time when a group of women decided to think of ways to help solve the issue. So they went to the state-owned water company PT PAM Jay and registered a complaint. But they received no response because of the tedious official procedure. Since 2004, we have been working with women in different districts where there are similar problems. We are trying to solve the problem, first, by having collective discussions and then starting to work with larger movements in Jakarta and in Indonesia. There have been a lot of discussions, campaigns and actions. We finally decided to take the process forward through litigations. We had a citizen lawsuit that helped us sue our government for violating citizens’ rights. We also included the names of corporations in the parties we were suing. We won in the first court [in 2015, a district court ruled the privatization of Jakarta’s water was illegal], but the government appealed it. The government won the next round but it was not because of the substantive consideration of judges. We appealed in the Supreme Court and then won again [October 2017]. PD: What is the current status of the protest? DNAY: Until now, we have been waiting for the decision to be implemented. It is also due to the political situation in Jakarta. We are going to have a new governor [Anies Rasyid Baswedan] and we are yet to see how committed he is to changing the situation although he has already promised that water will become the right of people. We are waiting and side by side, monitoring and talking to him and other governments about how to implement the Supreme Court’s decision. Besides this, in the national context, there are several civil society groups which have challenged the law of water resources management that became the source of water privatization [Water Resources Law No. 7/2004]. These groups won in the constitutional court and the law was revoked [in February 2015]. The parliament then had to pass a new law again. The government says that they have to consider the contract between the Jakarta government and the company [to implement the ruling]. Meanwhile the citizens, including women, are experiencing several problems such as inaccessibility to water, sickness due to bad water quality, etc. If the RCEP [Regional Comprehensive Economic Partnership, a mega free trade deal] comes, then there will not only be two companies to control the water resources but it will further privatize water in Indonesia. There are very few communities who can still access water for free now and in the future, with RCEP and other trade agreements, we will have much less access to water resources as all of it will be grabbed [by corporates] and it will cost us our sovereignty. PD: How did the campaign against privatization of water start and what were the challenges? DNAY: One of the key components of our victory in the Supreme Court was the campaign. We had a strong campaign because of the awareness of those who were directly affected in this case. The first thing that we did was the strengthening of critical awareness among women. After they realized the situation, women were were very enthusiastic to fight for their rights. Earlier, they didn’t see much of an opportunity for things to improve, but through group discussions and some village training programs, they became aware of the opportunities, the laws that can be used and the importance of reaching out to people. Since then, some women leaders started to brief and talk to both women and men in the community to influence and motivate them. They also spoke to the media. The media also played a positive role in this case. There was a lot of coverage of peoples’ struggles. Whenever we had a court session, the women used to come and conduct actions and media used to cover that. Besides this, a women leader spoke in the court as a witness, and later spoke to the media and in several other press conferences, and I believe that when there is someone coming directly from the community, it makes the campaign stronger. The challenge that we faced and still face is corporate power. The advocacy campaign really worked but we haven’t completely succeeded in terms of shifting the paradigm or perspective of some sections of the public because the water crisis is an issue which mostly affects the poor neighborhoods. But despite these limitations, this movement has gained the support of other struggles as it doesn’t only focus on the right to water but also talks about trade, economic justice and international financial institutions. PD: There are ongoing struggles against the neoliberal policies of international financial institutions across the globe. People in Argentina are putting up a strong resistance against the government’s move to take a loan from the International Monetary Fund (IMF). Indonesia is soon going to host the annual meeting of the World Bank and IMF. What actions have been planned by the people’s movements? DNAY: The coming October is very crucial for our movement as the annual meeting of the World Bank and IMF will be held then. It is a crucial moment for the global movements to band together and show them that they are not welcome anywhere. We don’t want them to think that we have no problem with their existence. We will have assistance in this. We have a lot of people who want to join our movement – people not only from Indonesia, but also from Philippines, India, Thailand and even Latin America. So we plan to speak out about the havoc caused by the infrastructural projects of the IMF and the World Bank, and also about how their regulations and their proposed assistance leads to impoverishment and disaster. So we aim to get together and mobilize in support of the resistance and highlight this as a common problem. We know that the whole economic system is interconnected. The World Bank and the IMF are also related to the RCEP, to WTO, to capitalism and to the whole political and economical system. We also need to speak about our own system, about people’s interests, about people’s initiatives, about what the people want from their economic, political and other systems. We already have a lot of examples and practices in the communities that uphold equality and justice. This is what we want to show to the public, to the government and to other people – that an alternative economic system exists and that is what we want. On Thursday, workers in the energy sector in Greece went on strike against the government’s plans to privatize the sector in the country. “Shut down the IMF-World Bank, not people’s dissent!